I learned the lesson the hard way. When my husband had non-Hodgkin’s Lymphoma with central nervous system involvement, I didn’t take care of myself. I spent all of my energies taking care of him, trying to keep up with my job, and parent our two young children. As a result, I gained 50 pounds. Those extra 50 pounds hung around and made other aspects of my life more difficult. When Pedro first received his diagnosis, I had just started an exercise program after moving to a new home, new job, and a new state. For the first few months, I kept on exercising. But as his cancer progressed, I used my busyness as an excuse to avoid exercising. Instead, I should have made a firm commitment to exercise vigorously for at least thirty minutes a day. The exercise would have helped regulate my emotions as well as provided a boost to my immune system and metabolism. During my second caregiver journey (when our college-age daughter had to move home to deal with an undiagnosed mental illness), I made a point to exercise regularly. I managed to not gain weight NOR to turn to overeating as a way to cope with the angst of caregiving. Overeating often acts as a corrollary to not exercising. During Pedro’s illness I convinced myself (an easy task), that I deserved to eat whatever I wanted to. After all, I had put my life on hold to take care of my husband. I had earned the right to indulge. This attitude did nothing for my health. It added to my stress as I rapidly went through my wardrobe and had to continue purchasing larger and larger sizes. I discovered during my second caregiving journey the difference making a commitment to self-care could make in my experince. Instead of indulging myself with “I deserve to eat this” statements, I nourised myself with “I only want to feed my body good things” statements. When I wanted to curl up in a ball of frustration over another argument with my daughter, I chose to go for a run or a long walk instead. I discovered that walking and running (without music or headphones) helped me process my angry, bewildered, frustrated, and unproductive emotions. These two attitudes—eating to nourish myself and exercising to process emotions—kept me from gaining weight or suffering from caregiver PTSD. In order to make this link up user friendly AND pertinent to caregivers and their needs, please make sure that what you link up follows the guidelines for the week. This week is for SELF-CARE ADAVICE FOR CAREGIVERS (if your self-care advice has a story wrapped around it, that’s fine). If you aren’t sure if your link is appropriate, feel free to email me at anita at blessedbutstressed dot com and ask! We will delete links that aren’t on topic in order to keep the link up a true community resource. We WILL contact you first and let you know that we will remove your link. For non-caregiving related links, we invite you to participate in the Inspire Me Monday link up over at www.anitaojeda.com. By linking up, you agree to receive weekly reminders about the link up. Do look for the caregiver boards on Pinterest. Do link up more than one post! This week’s community spotlight shines on Martha Grimm Brady. She cares for her husband, who suffers from stroke symptoms. This past October she wrote a series on self-care for caregivers on her blog, Gritty Grace. Take a few minutes to visit Martha and read the great advice she has to share. Join the 5-Day Self-Care Challenge for Caregivers and start taking care of YOU! You're just one step away from the challenge! Check your inbox and confirm your subscription. Anita currently teaches English to 7th-12th graders. She describes herself as a 'recovering cancer caregiver' who gives thanks daily that her husband has been cancer-free for ten years. Yes! I want a FREE book! 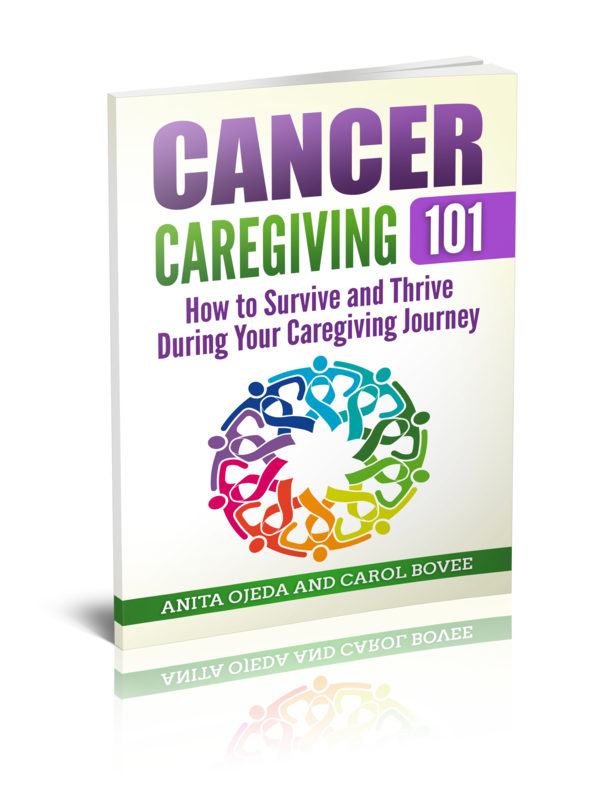 Whether you're new to caregiving, or in the middle of your journey, this book is for YOU! We don't share our list with anyone. I'm so glad you stopped by! I have a passion for helping caregivers understand that they're not alone on their caregiving journey. I also write about healthy (er) living and whatever else strikes my fancy. Pull up a chair and let's get to know each other! Join us each Wednesday for Caregiver Connections! ©2019 Blessed (but Stressed). Powered by the Get Noticed! Theme.